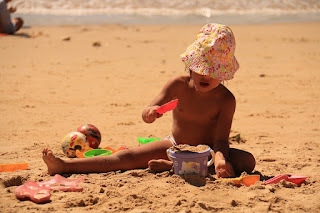 -- Playing in the sand is all about building sandcastles, digging holes and playing with friends! We can build sandcastles, search for buried treasure, and more! It does not matter where you play in the sand - whether on the beach, in the sand pit or on a construction site. Even adults may dig in the sand on this day! -- Relive a day at the beach with this lovely book of memories. You can almost feel the salt spray on your face and smell the musky scent of ocean in the cool morning air. Remember how the sand squishes between your toes as the tide rushes to shore and taste the tang of the ocean on your lips. Spirited language evokes a sense of closeness and nostalgia for an old friend. • Seaside Sidekicks Sand-and-Water Sifting Funnel -- An exciting sand or water funnel for outdoor play. Different layers funnel, tip, spin and sift.